Doran Scales is a manufacturer with more than 30 years in the Electronic Scales market. The Doran Scales products have recognition due to their high accuracy and their high level of performance. These products perform great even in the most hostile and harsh environments and under the most capacity demanding tasks. Other aspects that define Doran Scales equipment are the durability, versatility, and ease of use. The company has a commitment to offer a wide variety of product options that cover many industrial and commercial applications. In any situation required by the customer there is a Doran Scales product that can be easily implemented to do the job. This is true even for special tasks such as checkweighing, batching, or grading. The Model 2200 digital bench scale offered the possibility of advanced functions with its intuitive keypad. The easy to use full function keypad allows for simple entry of digital tare, time and date, accumulator, eight product ID’s, eight set point outpoints and eight grade values. The Model 2200 offers the power to make the weighing system an integral component of your day to day operation. Standard software features such as programmable data communication, product grading, peak hold, multiple ID numbers, accumulator, and counter offer the advantage of controlling and monitoring the manufacturing process. RS-232 ports allow communication with computers and printers, also this feature offers the advantage of data managing and exchanging. Superior washdown protection has been engineered into the Model 2200 Advanced Weight Indicator. From the heavy gauge stainless steel to the innovative gasket design, the 2200 meets the NEMA4X and IP69K classification, hence the washdown protection is guaranteed. This is a high technology instrument with a built-in database. This internal database will store up to 250 Checkweigh Tolerances, Tare Weights, Accumulation and Counter totals, and six-digit Product IDs. Also the product has versatile communication options like two standard RS-232 ports that allow interface with printers, PCs, and others. The 2200CW Weight Indicator also has the Guardian Harsh Environment Protection System, which acts as a defense against the damaging effects of shock, water, abuse, and other environmental factors that can cause costly repairs and production downtime. 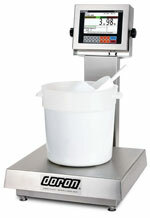 Contact us for additional technical information about the products just described or any other Doran Scales product. We have a staff of fully committed and prepared professionals to help you design and implement the weighing system or to choose the weighing instrument you require and within your budget limits. Here in globind.com we have a vast amount of weighing solutions and products by a numerous group of different manufacturers. You can be sure we have the right answers to every question when it comes to weighing technology! !